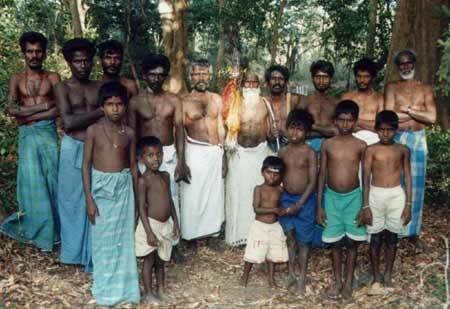 Tamil-speaking Vedda men and boys who walked from Mutur (Trinco Dist.) in the Kataragama Pada Yatra, Yala National Park, July 2001. In 2003, seventy Tamil-speaking Vedda men, women and children walked from Mutur. The United Nations Working Group on Indigenous People (UNWPIP) which held its 14th session recently, in a letter to the President has urged the Government of Sri Lanka to recognise and respect the rights of the Wanniyala-aetto to maintain their traditional subsistence and live according to their culture. The working group has also urged the Government to "cease all acts of repression." The resolution was issued in support of the Wanniyala-aetto following a representation made by Uru Warige Wanniya, the son of Tissahamy, the chieftain of the aborigines of Sri Lanka, at the recent sessions from July 29-August 2 held in Geneva. The Working Committee has endorsed the land claims statement of the Wanniyala-aetto where it is demanded that the Maduru Oya National Park which they claim is jungle area which has traditionally been their hunting grounds be returned to them. They also articulate their desire to "evolve, adopt and adjust" themselves at their "own pace". They request a two-pronged education system, formal and informal (practical) adjusted to their needs as a community. Uru Warige Wanniya in his address to the participants set out the history of the repression of the Wanniyala-aetto and the ills which have arisen as a result. He lamented that new diseases such as obesity and diabetes were taking toll among his people and alcoholism too was creeping in upon them. "We are not members of the majority people, we are not Singhalese, neither are we Tamils, nor are we criminals. We are simply a people attempting to remain true to who we are", concluded Wanniya calling all participants at the working group to support their cause. The participants have pledged their support to the Wanniyala-aetto in their effort to protect their rights to their land, their heritage, culture and survival as a people. Two members of the Wanniyala-aetto were taken to Geneva for the session of the UNWGIP by Dr. Wiveka Stegeborn, a Swedish anthropologist who has worked among the aborigines for some time.